Tell me the high idle symptoms. startup? Always? Cold? Warm? Always. The only time I've gotten it to idle at 750 rpms is if I have the IAC plugged in and create a large vacuum leak (unplugging the brake booster, pvc, or the likes) and then close the vacuum leak and it'll idle perfectly at 750 rpms for a little bit. It typically idles around 1250-1500. AC on usually drops the rpms like 250ish. Okay. Let’s start from scratch. First off, that’s not an idle adjustment screw. It’s a throttle butterfly stop screw. It’s purpose is to allow the butterfly to be as close to completely closed as it can be without binding or wearing into the throttle body. It was never intended to be adjusted in the field. But, Uncle Bob didn’t know that, did he? Engine off. Back off the butterfly stop screw with a 3/32″ allen wrench until the butterfly is completely closed. Now. turn the screw in until the FAINTEST movement of the butterfly opening is detected. 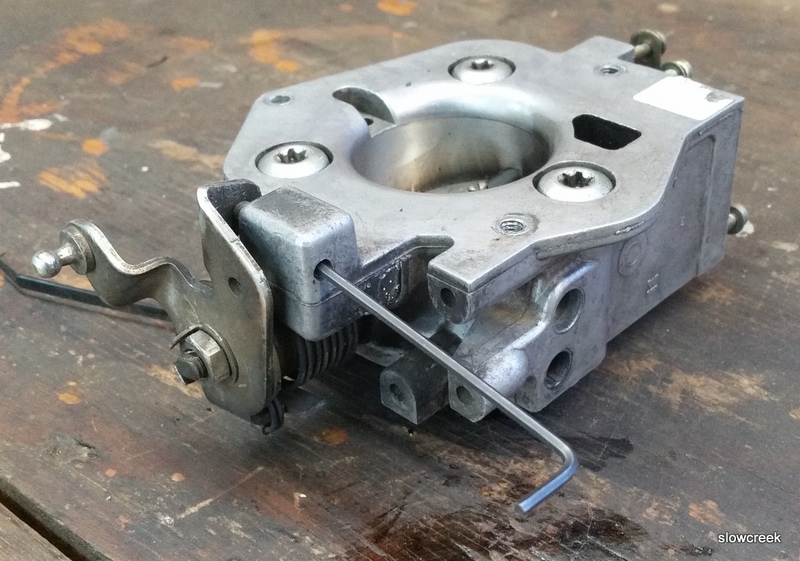 If you have a .003″ feeler gauge, or something that thick as measured with a caliper, use that to set the clearance. We’re talking sticky note paper here. This can be done more easily with the throttle body removed. If you remove the throttle body, be sure to replace the gasket underneath it after thoroughly cleaning the old one off. Did it idle high before the throttle body was installed? It idled low and surged. It was only running on 5 cylinders. I pulled the engine and transmission. Then rebuilt the engine using a Renix block, bored .030 over, comp cam, 7120 head, 99+ intake, and swapped in an ax-15 all were put in at the same time. check the throttle body adjustment. I messed with the throttle plate some and didn't really seem to make a difference. 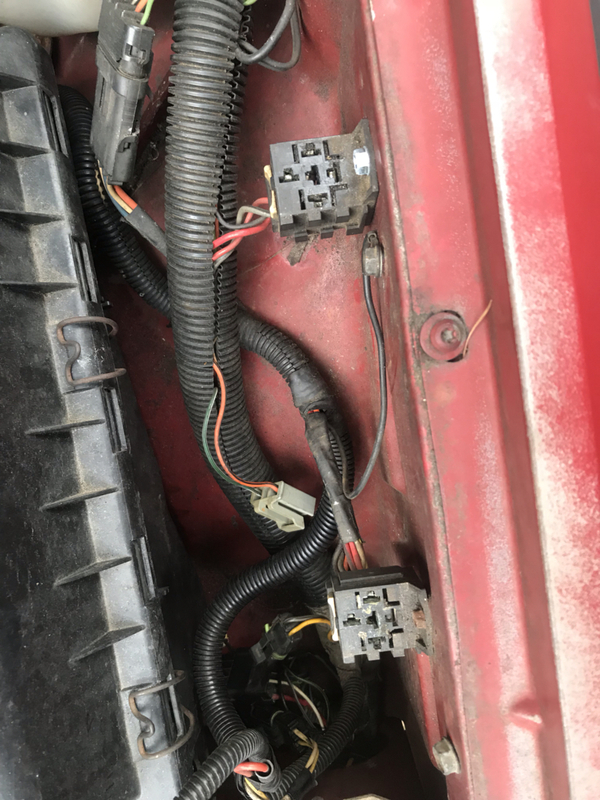 I was reading another thread on CC and remembered I had done an ecu swap from an auto Cherokee. Possibly that caused the issues? Should I be on the lookout for a manual computer? eCU won't make a difference. Tinkered with it more today since I saw some stuff on the inter webs last night and figured it wouldn't hurt to look at. Hopefully I'll get some better gas mileage because I discovered the o2 heater fuse was blown from a previous incident where the wires were pulled out of the plug. So I got that replaced and I don't know if it helped or not, but it seemed to idle around 1000 instead of 1250+ and it was pretty smooth and consistent. Also, I read a thread that said their electric fan came on with the AC and mine never has so I got to looking into that as well. When I bought it the guy had cut off the end of one of the plugs and ran the fan straight to a switch so I didn't know how it went from the factory. 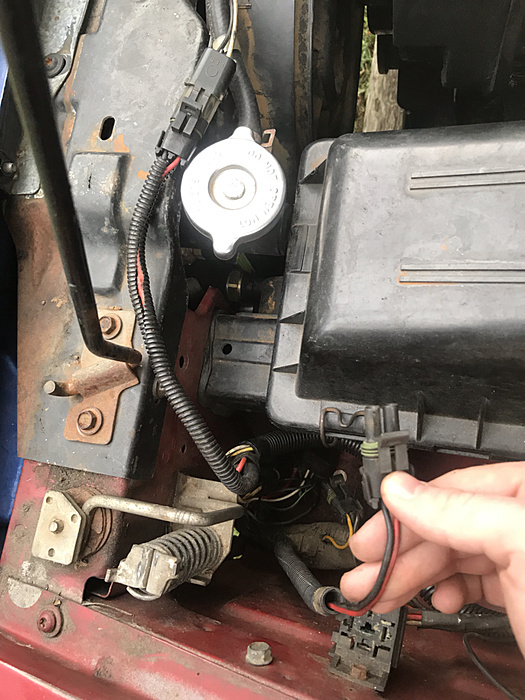 so there are these two harnesses here and when plugged into the one in my hand it there has to be a relay in the top relay connector, but with it in the harness it was plugged into the fan was running with the AC with no relay in either plug. So to sum things up, why are there two harnesses that both work right next to each other, and what are those two relay holes for? Obviously the back one seems to go with a harness that can power the fan and turn it on based off of temp, but what about the rest. Does anyone know what IAC and IAC housing combo I need for my renix Comanche with the HO TB? It has an IAC and a IAC housing from a 92 cherokee I believe right now. The IAC might be the renix one. I don't remember which one is in it at the moment. On rock auto they list two different parts, but I don't know what the difference is. Well now that it's gotten down to the 30s here when I start it it will run at 750 rpms pretty rough till it warms up for a minute or two (by the time I stop at the stop sign leaving my apartment) it will be idling at 1500+ again. HO throttle body? I wonder if too much air is bypassing the throttle blade or it is out of adjustment. What happens to your idle if you stick your finger over the passage above the IAC?